Many central European countries have negative trends in demographic development. In regions with a strong change of the economic structure this is usually paired with a strong internal migration movement which creates a situation of economic, urban and social decline. An ageing population with all its consequences in the social structure and changes in the needs of urban and residential infrastructure. 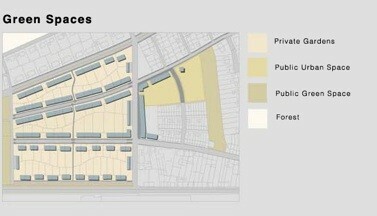 A deterioration of urban centres as a result of the migration into middle class housing estates outside the centres. A decline in the supply structure in urban centres that mainly affects older people, who in many cases are not adapted to car dependency. The results mentioned before compound each other and may lead into a" vicious circle." Within Germany, the Saarland is one of the regions most affected by this phenomenon. Up to 50% of the economic structure in the 80´s significantly depended on the mining and steel industry. Völklingen is a typical example of a city that has lost its economic basis economic basis with the decay of these and became a city in decline. It is rapidly shrinking, loosing up to 25% of its population between 2004 and 2020. A symbol of a bygone era resides in the middle of the city: the former steel mill from the 30´s the “Völklinger Hütte” (Hütte = Steel mill). The whole complex is protected by UNESCO as cultural heritage, Though it is not yet used as a tourist destination or a source of income for the city we believe this potential to exist and see it as one of the few positive criteria in the actual situation. The decrease generates a significant drop in property prices. This obviously creates a tough competition in the housing market, so far won by a type of housing that was previously not accessible to a majority of the population. People move from the centres to family houses in the suburbs or even in another town, which fosters the deterioration of the centres even further. Our project tries to find a solution to this problem. 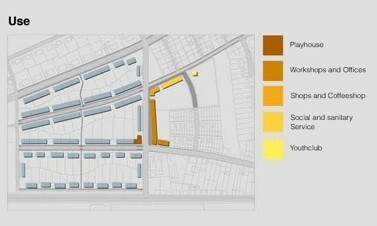 We propose the "reuse" of the storage yard as urban centre of the area, where we create both social and leisure facilities for all ages, partly in existing buildings, partly in new ones. The workers' housing type is found frequently in the Saarland and has had much impact on its development. Therefore it represents an important heritage of industrial and architectural culture and should be treated with care. Our proposal is based on the objective of providing current, mostly elderly residents with the possibility to continue living in their own home. This requires the creation of a social and sanitary “home service”. To improve the attraction for families and younger couples we propose to install a playhouse in one of the houses, which can work as organised childcare facilities for parents. We propose a workshop and office space for freelancers or small businesses fostering possibilities of independent self-employment. Besides these urban and functional benefits of the urbanisation should be able to face the trend of decline. 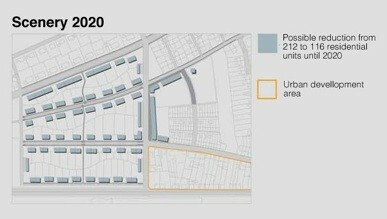 The current number of 280 residential units is reduced to 212 ensuring the ability for further reductions after 2020. 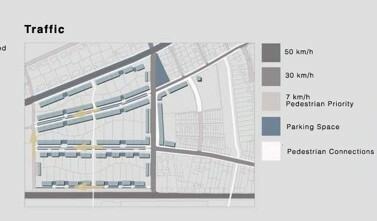 Furthermore it should include a traffic network which fosters non motorised transport and has the objective to keep motorised transport out of the neighbourhood. 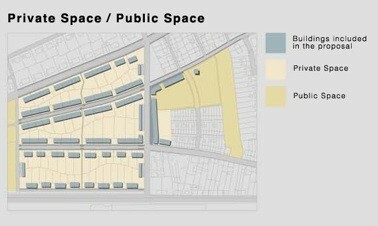 Finally it should involve an adequate proportion of green- and public spaces to improve its liveability.